This book gives a clear explanation of the rules of Xiangqi, followed by an in-depth look at each piece and their advantages. Mid-game strategies will seem somewhat familiar to the experienced Western chess player but will nonetheless give insight into this game. The section on openings is indispensable and will provide the beginning player with a strong foundation in the game. Two annotated games at the end of the book give the serious student a chance to analyse the play of professional Xiangqi players. This book has been invaluable to me and I highly recommend it. I have also bought Mr. Li's second book in the series, "Syllabus on Cannon" (see review) and I have on the way his third book "Syllabus on Elephant". 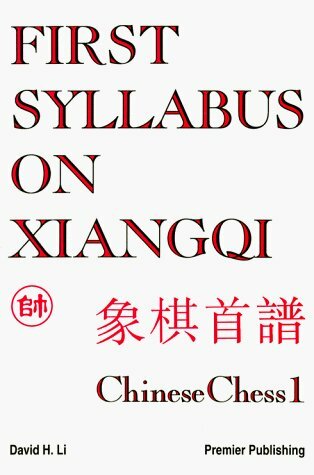 I believe that with time this series will prove to be an invaluable asset to future Xiangqi learners.